I rarely felt so happy to get home. What was I looking for, being five weeks in Italy? What was I looking for that I can’t find at home? I was traveling to get out of my comfort zone. So I felt uncomfortable last week when people asked me how it has been, and if I did this and that. What did I do? I felt I did nothing. At least I felt I didn’t do enough. My perfectionism monkey hit me in the face of guilt. My to do-list was just as long after the trip then before, if not even longer! Looking back to my trip now with some more distance, I see that I did a lot. I didn’t just go to Italy physically. I also traveled mentally and emotionally. What probably feels the best when you’re on a trip alone, is that you don’t need to take anybody into consideration. It’s very relaxing to just be alone and feel the freedom to do what you want to do, without any obligation from outside. Just be with yourself. This is the most important part: I left my self-consciousness at home. My self-consciousness which makes me overthink everything I do, my greatest creative block. In Italy I stopped being afraid of what others might think or feeling not good enough. I didn’t know these people and would never see them again probably, so I cared less somehow. Do you think self-consciousness is blocking your creativity? How do you get rid of it? So going out sketching was just fun. Something I don’t feel so much at home. 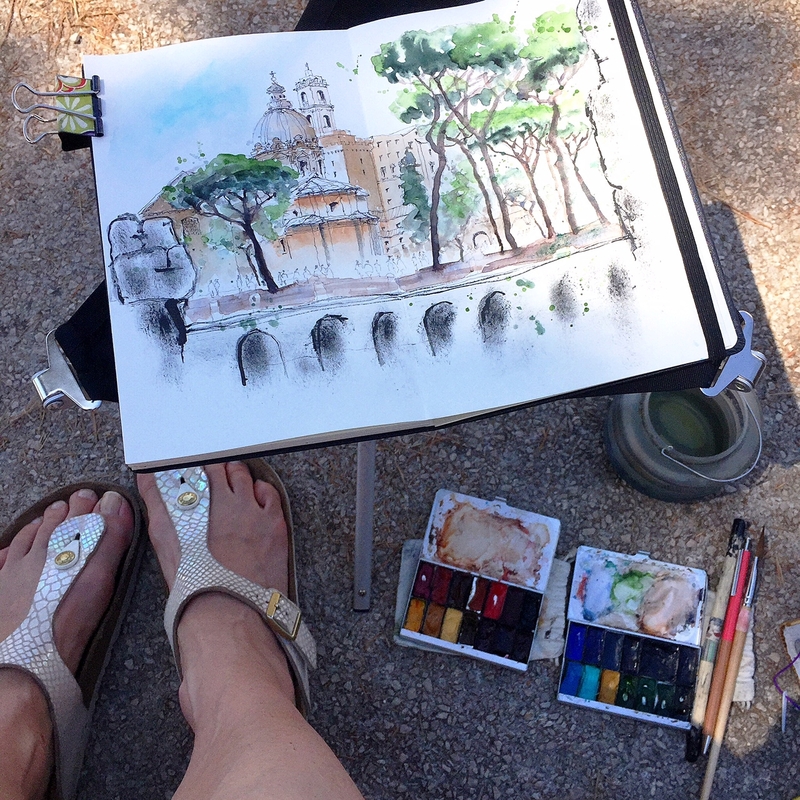 I found some great urban sketchers to go out sketching. Also some fresh new sketchers. I hope they’ll continue sketching! While being on a trip like this I walked into a whole new world because I was alone. I had to get myself out there. Force myself out there to meet people, to go sketching. Take initiative. If I would’ve stayed at home I wouldn’t have sketched so much. If I would’ve stayed at home, I would’ve stayed in my daily routine. I wouldn’t have felt the urge to create something new. I wouldn’t have been inspired by the new environment and the new people. Even if it wasn’t really comfortable and I feel frustrated I didn’t do most things that were on my to do list, I wasn’t “productive”… Eventually something will come out of this. Having been away and alone will have planted some seeds for further creations. Something will grow from it I hope. When you’re leaving somewhere, you’re arriving somewhere else. In transition! Every exit is also a new entrance. Every exit is a start for something new. It makes you feel vulnerable, which creates the space for something new to grow. I made some people draw that hadn’t drawn since they were kids and they lighted up. That felt great: Yes they could draw, although they thought they couldn’t! That’s always a wonderful moment. When you draw something, you take time to look at the light on the object, on the building, on the trees. 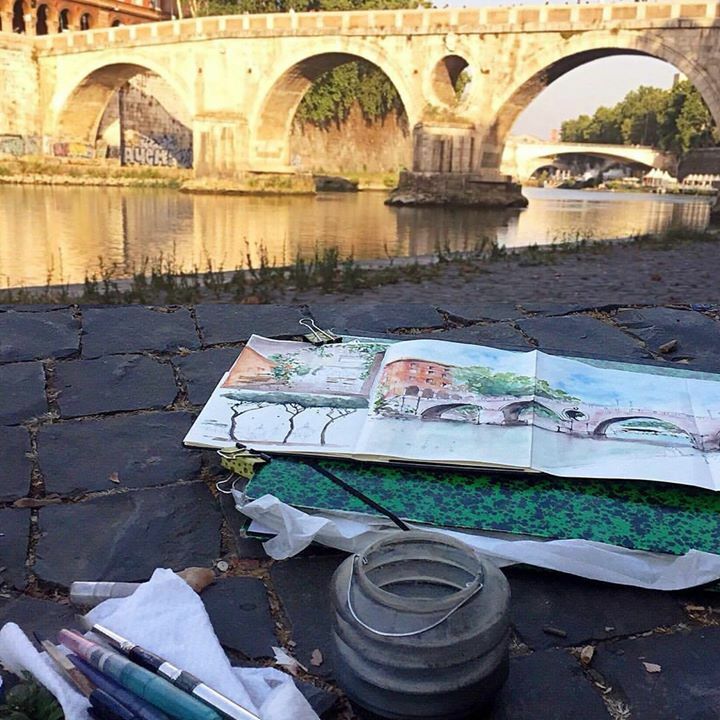 When you do urban sketching, when you travel (even in your hometown!) 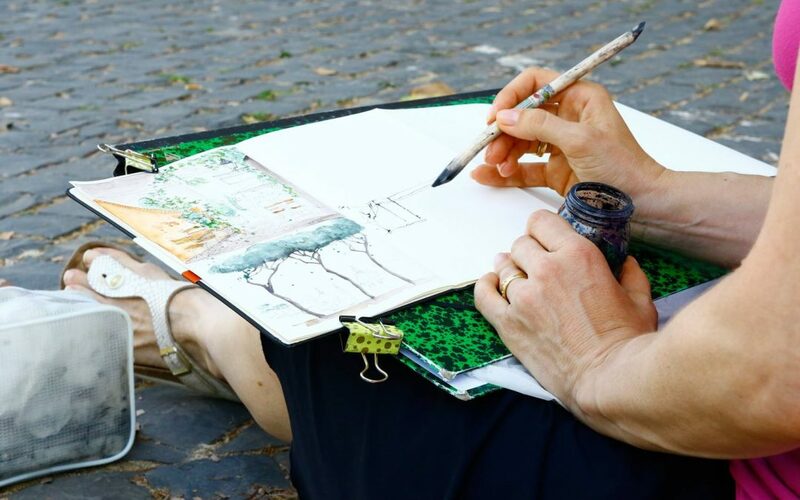 with your sketchbook you realize you’ll never again travel the way you did before. You’ll travel slower and look better at the world around you. You’ll take time for encounters. You’ll slow down even for everyday things to draw. And maybe the everyday thing is the most emotional? Drawing makes you see better and remember differently. Makes you live differently. It’s like a meditation. It clears the head. It makes me feel lighter. How do you feel after you did some drawing?